What follows is an edited version of the CFP prepared by Anna Mercer for The Shelley Conference 2017. You can read the original version here. Watch Nora Crook's beguiling presentation here! Multiple parallel panel sessions have allowed the organizers to present a wide range of exciting papers delivered by researchers from the UK, Europe, and beyond, as well as three featured presentations by eminent Shelley scholars: Kelvin Everest, Nora Crook and Michael O'Neill. These are some of the "superstars" of the Shelleyan world. 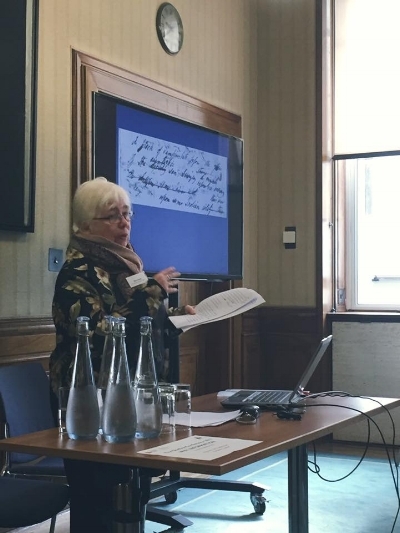 Today I am pleased to present the first of the three featured presentations: Nora Crook speaking on Mary Shelley's Editing of Percy Bysshe Shelley. This lyrical and passionate presentation provides insights into the extraordinary care with which Mary edited and even enhanced her husband's poetic works. 21st Century scholarship is increasingly focused on the literary collaboration of these two uniquely gifted creators. The picture that is emerging is wondrous, and nothing at all like the two dimensional, comic book perversion offered by Haifaa al-Mansour's movie "Mary Shelley". See my review here. Next week? Professor Kelvin Everest on "The Heart's Echo"; a touching, beautifully judged paean to the way in which certain themes echoed down the corridors of Percy Shelley's short life. Myths of Love and Death (Macmillan, 1990) and numerous journal articles and chapters. onward), with special responsibility for poems edited by Mary Shelley after PB Shelley's death.